Mevlid-i Halil Mosque, meaning the mosque of the birth place of God's friend (Abraham), built next to the site where prophet Ibrahim (Biblical Abraham) is believed to have been born. The structure was named as the Scarlet Church as there are numerous scarlet colored pillars inside and the mosque were constructed instead of the structure between 1170-1175 years by Nur al-Din Zengi. Mevlid-i Halil Mosque and the skyline of Şanlıurfa, south-eastern Turkey, Rizvaniye Mosque is to the left. 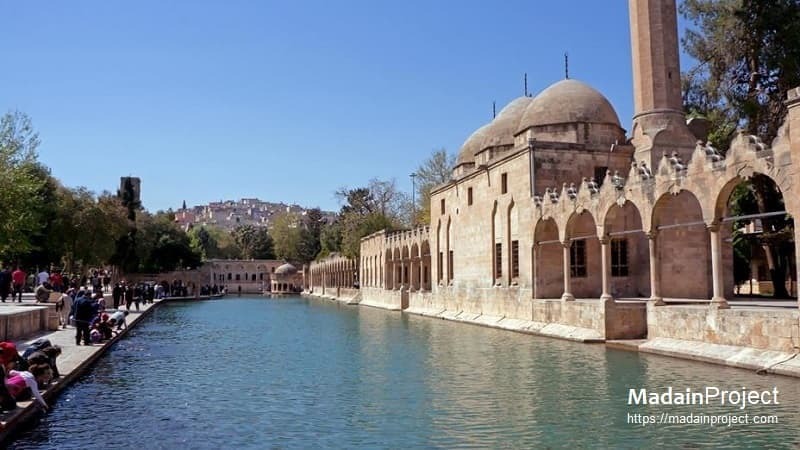 The mosque is the most ancient of the mosques located in the city center of Urfa province. As the structure was an old synagogue, it was transformed into the St. Stephon Church by the Bishop Rabula whom had died between CE 435-436. Main courtyard of the Mevlid-i Halil (Dergah) Mosque. Interior of the Cave of Abraham at Mevlid-i Halil Mosque. Pool of Sacred Fish near the birthplace of prophet Ibrahim at Mevlid-i Halil Mosque.